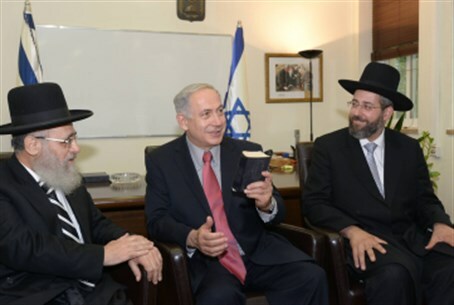 Prime Minister Binyamin Netanyahu met Thursday with the two new chief rabbis – Chief Sephardic Rabbi Yitzhak Yosef, and Chief Ashkenazi Rabbi, Rabbi David Lau. "You are the rabbis of the Nation of Israel – but first and foremost, you are the rabbis of the non-religious public, which needs you, your help, your patience, your knowledge, your erudition and your tolerance. Do good unto the Nation of Israel – I am sure you will. Rabbi Lau said that their main mission is to help the downtrodden, who need them most. “The ones who are doing OK in life, perhaps they do not need us as much,” he said. Rabbi Yosef noted that the commandments regarding the relationship between man and G-d, and the ones regarding the relations between man and his fellow man, were written on the same two tablets. Therefore, he said, it is clear that the two cannot be separated. Therefore, he said, it is clear that the rabbis must do all they can to bring the public closer to the Torah world.